Tesla Motors just posted on their facebook page that they'd taken a Model S to the Circuit of the America's. MotoGP is going to be there next weekend (and... uh... if the TTXGP/e-Power merger had happened more quickly, the eRoadRacing race would have been happening that same weekend). They took 6 laps around the track - and don't say anything about the characteristics of that lap but did leave this picture for us. 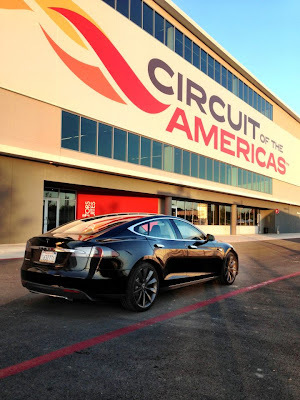 This isn't, of course, the first time Model S's have run on a race track. A whole fleet of them came to the 2012 REFUEL race at Laguna Seca.